AUDIOBORED – 2003 | JONAH BRUCKER-COHEN, PH.D. AUDIOBORED – 2003 – JONAH BRUCKER-COHEN, PH.D.
An online public audio message board and answering machine. AudioBored is a public online audio messaging board that allows for anyone to call in, record a message, and post it to the server. Simply dial the free 1-800 number from the website and record your note. Visitors to the board can click on the sound clips and listen to all the recordings collected. Like an online bulletin board, AudioBored allows for candid opinions, thoughts, ideas, exclamations, etc… to be posted live in a shared online space as recorded audio through a phone interface. 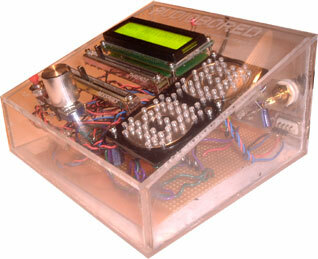 The AudioBored Machine allows people in a physical space to access all the messages left on the AudioBored. It is dynamic and networked, grabbing all call information as new calls are logged into the server. 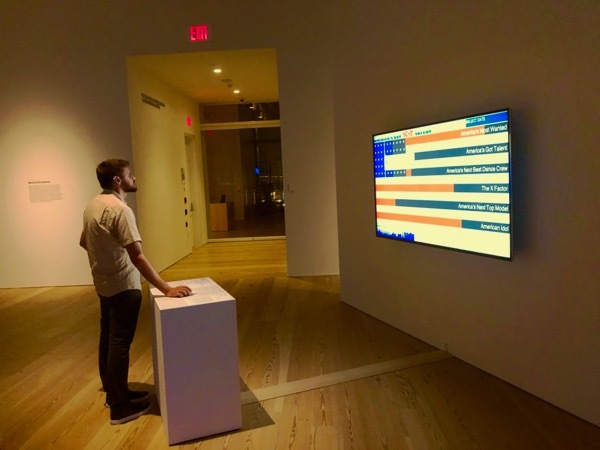 The machine is a physical version of a traditional online bulletin board allowing you to navigate through threads of messages (topics) as well as the messages themselves. Phonorama, 9/19/04 – 1/30/05 @, ZKM, Karlsruhe, Germany. PAUSE exhibition, 4/15/04 @ Oboro Gallery, Montreal, QC, Canada. How is information shared and retrieved? Should all information be free and public? What types of new public spaces does the internet allow for besides chat rooms, bulletin boards, web sites, moos, muds, etc…? AudioBored is a framework for a shared public audio space where anyone can record a message and share it with the world. The project extends the possibilities of communicative spaces to all all forms of personalized media that can be shared. AudioBored allows for people to contribute to a shared online public space without a computer. Since standard telephones (including mobile and stationary phones) are ubiquitous and exist in far greater numbers than computers, they provide a low-cost entry point to the Internet. AudioBored opens up the landscape for public contribution to distributed online forums where everyone is allowed a voice – independent of having Internet access or individual financial situations. Everyone has access to a phone – whether it’s a pay phone or a personal mobile or a landline, access to telephony systems is within most people’s price ranges. Since the advent of mobile telephones, location-based information systems are gaining momentum. AudioBored’s strength comes from people entering messages or broadcasting from specific locations (such as public events, political rallies, entertainment spectacles, etc…) that are time and place specific. Since AudioBored’s clips are online, they can be accessed easily from any location thus allowing for site-specific media to be shared globally. The system uses VoiceXML (a subset of XML) through Voxpilot and speech recognition to decipher voice input in the form of voice or DTMF tones. Once someone connects, they are prompted to record their message and when finished, press the # key. Their recording is held temporarily, played back to them, and they are asked if they want to save the clip to AudioBored. Once saved (using PHP), people can go to the AudioBored site and listen to each clip that’s been added. 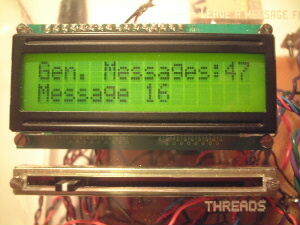 AudioBored Machine consists of an LCD display with two sliders – one to navigate “threads” of messages such as “The War in Iraq” or “General Messages” and a second to navigate individual messages. There’s a play button to hear the messages, a stop button and a volume knob to adjust volume of messages. The machine is networked and grabs incoming data from the server when a new message is uploaded. The LED inside the “O” blinks when a new message is waiting and it is displayed on the LCD. Future versions of AudioBored will allow for more customized user input such as inputting location, name, and subject of message. This info will be catalogued along with their clip and made into a searchable directory/database according to theme or subject matter. There will also be several visualizations and interactive experiments of where the audio is coming from based on the incoming info collected.